I’ve loved Annick Goutal fragrances ever since receiving samples of Eau de Camille and Eau de Charlotte, 2 fragrances created for her daughters. Typically, I preferred Eau de Camille to Eau de Charlotte’s overly sweet scent, but my interest in her fragrances was piqued and I always get excited by new releases. This isn’t new, but it is on sale… so if paying almost £40 for a candle is as much an alien concept to you as it is to me, take comfort from the fact that this beautifully scented candle is down from £37 to £28, still a stretch for me, although I do admit to being tempted thanks to some left-over Christmas cash. 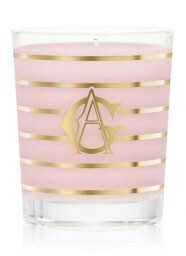 What are your favourite luxury candles? I have one Jo Malone that gets lit *very* occassionally (I’m talking about 6 times a year). My Yankee tarts (that phrase might get me some weird hits!) get a far greater airing. Oh dear, I get so easily led astray by candles. I love them but I have far too many! Must. Resist. Temptation. @DinkyLondon – Something far too enticing about them isn’t there?! I LOVE CANDLES!! Momma got me 2 for Crimbo, one vanilla one that is MASSIVE, and one red one with the most beautiful red velvet decorations on it. I love ’em, especially for the Winter. So cosy! @Dv – I love Vanilla, but I rarely get Vanilla scented candles as I always get too tempted by other more exotic sounding ones! @Sarah – The Yankee candles are nice, some are a bit overpowering… but as with most things, there’s a couple of crackers in the range. I like the little soy tarts that you use like a home fragrance oil.. they’re a quid each so you can try lots of different scents before commiting to a large candle. I wrote”quite nice” twice then. I’m clearly having a word-fail this morning!